This quilt adds a breath of fresh air to your home decor with the bright, cheery colors used in the on-point set of the pieced blocks. 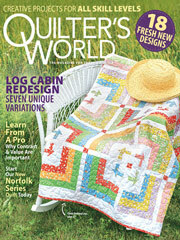 This e-pattern was originally published in the April 2012 issue of Quilter's World magazine. Size: 36 1/2" x 49 1/4". Block Size: 8" x 8". Half-Block Size: 8" x 8" x 11 3/8".